K3 @ 5 watts. Near Cleveland, OH. This was the black hole of Sprints! I heard ZERO activity on 20M and 40M was not a lot better here. 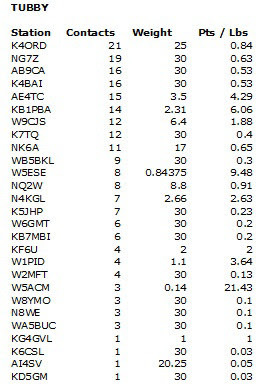 The stations I did hear I could not raise, and QSB was significant. At first I thought I had radio or antenna issues, but I tried switching around all the gear and experienced the same results. Well... there's always next month! This was the first time I have operated the Sprint for a couple years. All contacts were on 40 meters. The band was very noisEy here in Arizona. Rig: Sierra 2W on 40 mtr, 1W on 80 mtr Antenna: Doublet. Power 11 AA cells. This was my first Spartan. I enjoyed the QRP to QRP contacts. FT1-MP, 5W, TH6DXX, dipole, zepp, inverted vee. I was determined to participate this month despite cataract surgery on my "good eye" Monday morning. I have distoted vision in the other eye due to macular degeneration. I set up the program early and failed to check the comuter keying. When the contest period started, I discovered the computer wouldn't key the rig. This has happened once before, but I don't know why. After the first QSO, I rebooted the computer, but that didn't help, so I used my keyer and paddle for the entire two hours. 20M was open from CO west and north, but WG0AT was the only strong Sprinter heard. K7TQ was solid copy. I called a few other western stations without success and changed to 40M. 40M seemed very good, little noise, and little QRM. But there didn't seem to be the usual activity level and the skip zone was out as far as VA. West coast signals, particularly W7OM, were strong. I took off three minutes at 02Z for a state traffic net and tried 80M after the net. 80M w as also quiet with good signals out to TX, VA and IN, but noting from the ME. See you next month. Used the Big Rig tonight with the power turned down, to dipole @ 30ft. Had the K2 on the bench for recal. 20m was dead hr in Mich. at start of the sprint. 40m was vy noisy, es vy hard to pull some out of the mud. went to 80 es grabbed a couple Q's but didnt hr alot of activity. pulled the plug after an hr. see u all next time. Wow, conditions were rough last night. I was receiving better signal reports then I was giving which makes me wonder if my QRN is locaL. 80m was my producing band but I was using a wire sloper cut for 20m and 40m to receive on and my windom, up 40 feet, to transmit on. Thanks to those who were persistent enough to stick with me. Ft817 set at 1w into a G5RV up about 55ft. I had a geat time and thanks for the event. Well, another sprint is in the books. I finally broke the 30 Q barrier tonight. I started out on 20M and picked up five before the band died. Moved to 40M at 0110 and stayed there until the end. 40M was pretty busy up until 0200 and then things slowed WAY down. Thanks to Randy, K7TQ, for the only Q on 80M. Got two band contacts with K7HBN, W5ACM and WA5BKL. Texas was very well represented. See y'all next month. My first Sprint. Only managed two contacts in the short time I was able to play, but had a good time dragging out the PFR-3. I'll do better next month. One more time with the heavily used pair of 3.7 VDC, 200 mAh LiPo batteries on my ATS-3A! They did well for the whole event, but that's probably due to fewer contacts and judicious "CQ-ing". I was hoping for some time on 20M, but conditions only allowed one QSO with NG7Z up there. 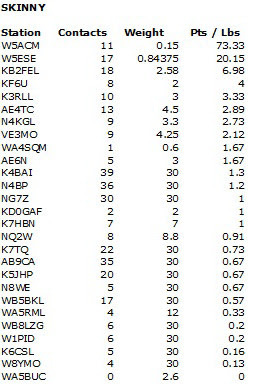 The majority of the QSOs were on 40M with lots of familiar calls like N4BP, AB9CA, K4BAI and W5ESE. The noise on 80M was terrible, but I did manage three QSOs before I ran back to 40M for a final QSO with K3RLL. This was a tough one. I am hoping for better conditions in November. Perhaps the LiPo batteries will go yet another month. We'll give it a try! The old vertical is doing fine, and the rebuilt micro-thin-plywood keyer paddle is holding up well. The weight varies from month to month due to the number of bands I operate. Three bands means three daughter boards, thus more weight. My station is Tubby, home station on commercial power. A Yaesu FT-450 running 5W output to 1 of 3 antennas. A Delta Loop, an Indoor- end-fed, coaxial dipole that is mounted on the center ceiling beam of my mobile home. An Indoor Horizontal Square Loop 12ft on each side, mounted in the ceiling of my radio room. I live in a mobile home park that allows no visible antennas. Rig is Hendricks PFR-3A running 3W out with internal batteries. Antenna 180 ft horizontal delta loop at 30 ft. Worked 40 meters only. Experienced a lot of QSB, and band went long during last 30 min. Enjoyed the sprint and thanks to all who participated. Conditions sounded better this evening so even though my time was limited, it was nice to make some contacts. Many thanks to those who pulled me out of the noise tonight. Rig was K2 at 5w to OCF 80m dp. Condx didn't seem to be too bad but weren't all that good either. Made no contacts on 20. Stayed there only a short time. Thought 20 might be weak when I could barely hear W1AW's Kw signal. Made 26 contacts on 40 and 9 on 80. Was a good evening despite the QSB. The noise seemed to be down a bit. Maybe winter condx will soon be here. The QSB made for especially tough copy of a couple of Q's - KD1JV being one of those. Sorry, Steve, but parts of your call kept getting sucked out every time - but we eventually made it. Thanks to everyone who stopped by - and for all the fills - and especially to those who do the work to make these sprints possible. Hope to hear you next month! Someone turned off 20 after 10 minutes. 40 and 80 were good except for the QSB and noise here on the coast. Let's hope for less noise next month! I used a Ten Tec R4020 on alkaline batteries, and I sent 5 watts as my power, but I think it was actually between 3 and 4 watts. In spite of working with our power company for months, my power line noise is about as bad as it's ever been. Apologies to those I could not copy tonight who were lost in the noise. Rig: K3. Antennas: A4S, 40/80 Trap Dipole. Went with my RockMight 20 tonight to keep the weight down. Heard some activity at the start. W5ESE. Guess the event starts too late for 20 to do much before it folds. Turned on my FT-817 to confirm the band was dead at about 0140Z. Let's see what next month brings. AB9CA was the best signal. N4BP, K5JHP, W5SNI, K3RLL, and tried hard to get KD1JV! K3/10 @ 5w to a 20M delta loop or a 40M extended double Zepp. My QSOs were roughly evenly split between 20, 40 and 80M. Nothing heard here on 15M. I had hopes of working several on all three bands, but no joy. 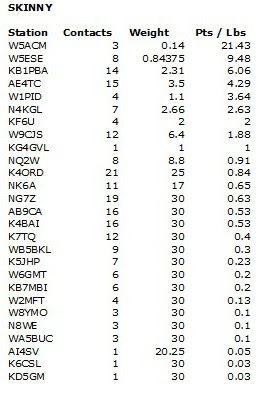 Best signals: on 20M - K7TQ, on 40M - AB9CA and on 80M - W5ESE (full disclosure: Scott is pretty darn close). It was nice to hear several 1W signals. Had fun. Had fun in the Spartan Sprint. First time back on the Sprint since June. Used an AT Sprint 3 and a 300' horizontal loop fed with open wire ladder line. 80m was the money band for me. Submitted my log to the ARRL's Logbook of the World. Had a good time. Thanks to all who pulled me out of the noise. 20m was a disappointment, didn't hear a peep. Managed 13 contacts. 8 on 40m and 5 on 80m. Rig was a FT817, 5w into a ground mounted vertical. Used my TenTec 1340 to the inverted vee at 40 feet. The band was in and out and short and long. N4BP and K4BAI were not as loud as usual. AB9CA was strong. Worked IN and TX. Heard W7OM - was loud - and then was gone. Thanks to everyone for the Q's and thanks to the organizers. Please listen for me during the NYQP - CU then or next month. I got home late from work and operated for 8 minutes and worked 6 stations on 40 meters. I haven't missed a Spartan Sprint in at least 10 years! Thanks all. FT-817nd @5wts + 80/40M dipole; First Spartan Sprint in almost a year. Could only get on for the last 30 minutes – probably the worst time slot! Band conditions seemed to be very poor. At first, I was wondering whether I’d missed the event completely. I still managed to snag AB9CA (Dave), NG7Z (Paul), NQ2W (Tony? ), and WB5BKL (Nick). Alabama, Washington, New York, and Texas in that order – go figure. Thanks, guys, for digging my signal out of the noise! FT817 to G5RVjr - Nice to hear some really, really strong QRP signals tonight on 40 meters for the Sprint. Thanks to those who pulled me out of the noise tonight. K3, Force 12 C4SXL @ 60 feet. Good conditions this month. 20 m lasted over an hour and 40 was decent too. Got K4BAI, NU7T, and AB0CD on 20 and 40 m. Had a couple of non-Spartan Sprinters stop by for a short chat. Fun Sprint. Rig: FT-817 2W to a 40 meter EFHWA up about 30'. PFR-3A for a couple, FT450 for the rest, all 5W;50'Speaker wire EFZ + G5RV; all battery power; Great Fun! Again tonight I started on 10m with no luck, moved to 15m, no luck their either, then moved on to 20m and 40m. Both 20 and 40 were quite noisey here this evening. FT-817ND @ 5W into an 80 foot zip-cord dipole at 50 feet. I was backyard portable in Ohio, visiting family for the 4th. I got a late start but managed to make seven contacts on 40m and 80m. 80m was very noisy here but 40m was much better. Thanks everyone for another fun sprint. Rough conditions, but nice challenge for me. Of course, I was fired up for the first summer 20 meter foxhunt and was wondering why I wasn't hearing KT5E or N0UR when it dawned on me it was Spartan Sprint night and the fox hunt was set for Tuesday! 3Qs on 20 and 8Qs on 40. Elecraft K-2 into homebrew 88-foot doublet at 25-feet fed with 300 ohm twin-lead/LDG 4:1 balun. Band conditions were quite reasonable for the sprint this month. All of the QRN from the stormsaround Houston was gone by 8PM, and although the QSB on 20M was a bit difficult, I still got five contacts before moving down to 40M. The ATS-3A continues to perform well. The two 200-maH LiPo's were charged just before the start time, and held up with no problems, even with a fair amount of CQ ops. There was no need to move to 80M, and I noticed that several stations on 40M were quite active right up to the end. With the exception of a QRO station on 7040 that never ID'ed, and appeared to be testing/tuning an amplifier, it was an excellent Spartan Sprint! A little more challenging than Field Day, the noise level was higher and QSB was more prevalent. Everybody seemed to roll down to the next band at the same time. Must have been lousy conditions at their location too! Good time and good perseverance by all operators to make the contact. FT1000MP, 5W, zepp, dipole, inverted vee. Activity much better this month. 20M was good for the first half hour. 40M was excellent. 80M had high QRN, but still made QSOs as far away as PA and IL. Hope to work many of you in IARU HF contest this weekend as W4AN from the QTH of W8JI. Rig was ATS-3 at 3w with 8 pack of AA NiMH for power. One pack lasted the whole sprint but they did seem to be getting tired near the end. 20 seemed in good shape - 26 q's there. The band was maybe a bit long with q's from CA, NV, DE, 3 from ON, MA, ME and some other longish ones. 40 seemed to have decent prop - 30 q's - but the noise was pretty bad. Did not find much activity on 80, only 6 q's there. Worked WA8ZBT on 3 bands, think he was the only 3 bander tonight. Worked W2SH, WA3FAE, K4BAI, AF4O, W5ACM, WB5BKL, NQ2W, K4ORD, W9CJS, AE4TC, W4VHH, and maybe one or two others that I have overlooked, on 2 bands. There seemed to be more activity than I've heard for a while. Good to hear so many familiar calls and especially good to hear some new ones in there. If you are new, welcome, and hope to hear you lots more. As always - thanks go to the guys who do the work to make these fun evenings possible! Fun! This was my second or third Spartan Sprint. I slimmed down a little by making a paper clip and bottle cap paddle and a battery bank of three small LiPo cells in a box. Rig is an ATS-3. My exchange was RST - AR - 5W. 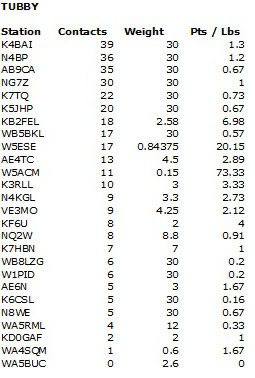 QSOs came about 50/50 on 20 and 40 meters. A fair amount of QRN on 40, otherwise conditions were OK.
My first attempt at the SP. Always wanted to play but being antenna restricted and having a church mission team meeting on the first Monday each month normally restrict my chances. Took advantage of the 4th of July day off to get an antenna up temporarily and give it a go. Wish I could play more and use a real antenna instead of a portable low NVIS type sky hook. Enjoyed the challenge! Fun two hours, brought back memories of operating in some spartan sprints a few years ago before I was ready to operate in full blown cw contests. Seemed to me as if everyone was staying on 40m and not moving to 80m, but maybe I just missed them when I took a quick break to work a few DX stations on 20m. KX-1 at 3 watts, antenna end fed wire indoors. Had fun again with QRP. Thanks to K4BAI for his patience with my signal. This time conditions were much improved. The FT817nd, T1 tuner and LDG 4:1 balun fed my 80m doublet on 80, 40 and 20. I used a 7AH battery for 5 watts. Think next month I'll just use the internal batteries and try 1 or 2.5w and get the weight down to 3lbs 12.5oz. Thanks to all who worked me and my rusty fist. Was using a newAmerican Morse Iambic key and after using a paddle for 40+ years, I just couldn't get the hang of it. I ran a DSW40 with 2 watts to an OCF dipole for about 20 minutes. Later I went on 20 meters with the tubby rig just for fun and to see how 20 was. I made 5 more QSOs, but didn't add them to my score. Thanks all. CU next month. My first Spartan Sprint. I have a place not far from my house on the edge of town behind an unused building at the edge of a long field. Ive been there several times for portable operation where going to the parks was not feasible. I wondered how long it would be before i got a visit from the PD. This time it happened. He said he was just checking out the vehicle. I told him what i was doing and showed him my HB-1A. He asked how far i had talked so far. I asked if i was harming anything and he did not mind at all, even saying he was sorry he bothered me. Of course i said he wasn't bothering me. I guess they have to check on nuts sitting in the back of their trucks behind abandoned buildings near dark :-). Antenna was a long wire about 65' with a approx 30 ground wire and L tuner. A short video on my youtube channel (plantopguy5) soon. Started out on 10 meters - listened and called - nothing. Went to 15 meters - listened and called - nothing. Went to 20 meters and made 5 Q's. Down to 40 meters and made 8 more. New rig and antennas out in the weather make a big difference - 40/20-meter inverted vee/fan at 40 feet and 2-element phased 10-meter quad at 25 feet on roof mounted, 8-foot, homebrew quad tower - see FD '10 soapbox for picture. Cool set-up but I'm not completely satisfied, yet. Stay tuned as I'm thinking about some improvements...Thanks for hearing me and thanks to everyone that helps make this Sprint possible. Had a great time. Was able to reduce my station weight this month with a smaller power supply and improved the number of contacts this Sprint. 19 total Q's, 3 on 20 and the rest on 40m with 12 different states. I was using a FT817, 5w into a Hustler vertical. Thanks! 80 M sounded dead but opened up an hour into the sprint. 40M was hopping the entire 2 hours. I use my IC-703 @ 5w. I'm amazed that some of the stations were running near 1 watt and I could hear them and work them. Like most ops I also have a 100 watt transceiver but there's something about the challenge of QRP that I enjoy. K3/10 @ 5w with 40M EDZepp + 20m delta loop. All my Qs were on 20 and 40m. There were a couple I just could not pull out on 20m - my apologies. Usually, I only make one or two contacts with TX but this time there were 5. Activity seemed up a little - which is always good. Had fun. Had company so only able to get on for last 46 minutes, nothing heard on 20m , on 40m made 9 QSO'S and on 80m made 1. Best dx was K7TQ, ID & AB0CD, CO. Rig, K2 @ 5W and ant's were 40M & 160M dipoles. Thanks to all, cu next month. For an enlarged view, click on the score sheets. ATS3 5w dipole up 18 feet. Low audio 20M (ATS-3 problem) New stations worked: K4ORD, WD9F, KFØN, KF7ADV, K8CV. 2 Watts using ATS-3 with AC power supply and 160 Meter horizontal loop at 30.' Band conditions were fairly noisy on 80 where I only made one contact the rest were on 40 meters. Rig, Icom IC 703 @ 5 watts. dipole antennas 80 very noisy but 40 OK. Just learning to run the IC 703 I got at an estate sale. Added a 500 Hz filter and it works great. Like March, I was hoping for some 20M activity, but the band was dead. Conditions on 40M were reasonable but noisy. I stayed on 40M for the complete sprint. The ATS-3a and backyard vertical did well, even with some above-average CQ-calling ops. The two LiPo, 200 mAh batteries held up well, but they were dropping fast near the end of the event. Come on 20M! Was busy fiddling with my old Ten-Tec Argonaut 509 when I realized the Spartan Sprint was half over. Decided to just use the Argonaut in the Sprint. I understand that in the "olde days," some folks actually did backpack with this rig (which weighs about 6 lbs)! Also used my J-37 straight key. 5 Watts with a K3 to 20mtr EDZ. Worked only first 30 minutes and last 10 minutes. K3/10 @ 5w + 40M EDZepp. I made an effort on 10m, 15m and 20m with zip results. Even a long series of CQs on 80m yielded nothing. 40m was all that worked for me and most were faint - with two exceptions: K4BAI @ 5w from GA and K4PQC @ 2w (also GA). Both had outstanding signals - John's was 599+. A curious evening. Had fun. Kenwood TS-870 @ 5W. Antenna is two Alpha Delta-DX'-A'S - Counterpoise through tower and beam capacative hat. No QSOs on 20M after 15 minutes of calling CQ. Went to 40M and picked up 18 QSOs with heavy static. At 0200Z went to 80M and got two QSOs when a line of lightning and thunder came through South Milwaukee. Went QRT - Could hardly hear a station. Thanks to everyone. CU next month. My first Spartan Sprint. Two TX stations: WB5BKL and W5ACM on 40. WX was not my friend tonight with rain and static so stayed in and used the FT-2000 @ 5w. Could only hear the loudest stations through the noise. Next month look for me on my FT817 @ 1w w/solar-charged batteries. WA8MTI (mighty tiny input). ATS-3 to 88' doublet up 40'. Using a bigger battery, called CQ and got a short run going. All contacts on 40m, and more than half to 5-land. Wonder if that geomagnetic storm is responsible? Called it quits about 0300z. Rig was my new K1 @ 5W to EFHW up about 30.’ Nothing heard on 20. Spent the rest of the contest on 40. Best signals were KFØN and K5JHP. Got lots of practice pulling out weak signals – it’s usually the other way around. It got lonely on 40 after the first hour – most everyone must have moved to 80. I’ll be back next month with an 80m antenna. Thanks for all the fun! 20M was dead from about 2300Z on Monday. 40M was great for about 20 minutes. Then, activity dropped off and QRN came up. Made about half of my QSOs on 40M in the first 20 minutes. Then the second half on 80 and 40 during the next 100 minutes. Thanks for the QSOs. Looking forard to next month. FT1000MP at 5W, WM-2 QRP wattmeter, dipole, zepp, inverted vee. Best DX on 40: VE3MO, W7WA, NG7Z. And great to work Doc, KØEVZ. Best DX on 80M: WGØAT in CO. Please look for me and KU8E as K4BAI/M in many GA counties in the Ga QSO Party this weekend, April 10 and 11. This was one of the strangest sprints ever. A large geomagnetic storm shut down 20. The only station I could work on 40 was K4BAI. I managed to work 2 stations on 80 ... K4ORD and W1JSB (who is 3 miles away). There was VERY heavy auroral flutter between W1JSB and me. I would have thought we would be ground wave?! I was running an IC-703 at 5 watts to a Windom OCF dipole. Thanks all. QTH was a bench in Prospect Park, Brooklyn. I spent the first hour cutting a new antenna wire, raising it into a tree, and trying to get a new multi-band tuner to work that I had just built from a kit. The tuner was completely nonfunctional so I eventually went back to my trusty EndFedz EF-40 matchbox, which worked great. Rig was an FT-817nd, with porta-paddle 2 key. I'm a novice CW op and so most of the QSOs were going too fast for me to follow. I found an empty spot near 7.030 and called CQ SP for a bit and got one reply: N5OBC running 1W in Oklahoma. Another station tried responding later but I couldn't dig him out of the noise. Even though I only logged one QSO it was fun, and I need all the CW practice I can get. I'll be back. Started off right at the bell on 20M but didn't hear any sprinters. Called CQ for five minutes with no replies. Switched to 40M on 7040 and then 7030 but the sun is still up. I could hear a couple of SP CQs but no one could hear me. Still too early here so I did some chores and came back at 0200Z hoping that condx would be better. Called CQ and made 5 contacts. I could barely make out the ones I worked and still heard callers but it was no use. The atmospheric noise was abominable so called it quits at 0218Z. Thanks to John K4BAI who held in there until I could get his call. Same for WA5ZBT at 1W and W5ESE at 2W both of whom were in TX. The other two I got were Doc KØEVZ who was booming as usual and W5ACM with his 3W in TX. Had to move a few hz down because some PSK clown started up zero beat with me. 7040 is becoming unusable. I did notice during the ARCI contest this weekend that most everyone was using 7030 but that was probably due to the EA RTTY contest. Nevertheless, the 7040 watering hole is fast becoming a digital haven. 72 and see you next month. OK, this was my first sprint in maybe two years as I fixed up one house, sold it moved to a new one, fixed it up and finally put hamming on the board. New house is a no antenna place so I'm learning to adapt. Wit h15 minutes left I got on and the slinky in the attic is much better than the shorter wire was. Its also better than the gutter ... Dave W2VV had a great signal into my one watt SST fed by 10 nicads to the slinky. This proves there is hope for hamming here at the new diggs. Thanks for the sprints they are still great fun. Once again 20 meters was dead. I had hoped for better as I had made several 0100Z contacts just last week. Also, once again heard a week station at the start. Rig: RockMite 20. Ant: 66'7" end-fed wire. Rig was K2 @ 5W Antennas: 160M and 40M dipoles. Nothing heard on 20M. 40M was very odd at first signals were strong, then very weak and most of what I heard were from the south. 80M had S9+ QRN, only able to get W1PID and K4BAI. 2 QSOS on 80M and 9 on 40M. Hope next month is better. Rig: ATS-3 @ 3-watts to a 240 foot loop antenna. Wow, what a difference a month makes! Only 10 contacts this month compared to 39 a month ago. The QRN was murder here due to local thunderstorms roaming through Iowa and points east. Only had a half an hour before a check of the local radar on the PC showed that the whole area was lightning up like a Christmas tree (!) and it was time to put the QRP toys away for the night. Only 40M was usable here. I checked 80M but, as I thought, it was a lost cause. My poor little ATS-3 receiver was in saturation due to the lightning in the area! Let's hope that things quiet down a bit for May's contest. Rod, W7OM, had a great signal from Washington state which was my best DX for the evening. Thanks to all who called in. I hope we can make a go of it again next month. Only had a short time to play this evening, but finally, finally had the good fortune to make contact with wGØAT. That's a successful Sprint for me, indoor antenna or not!